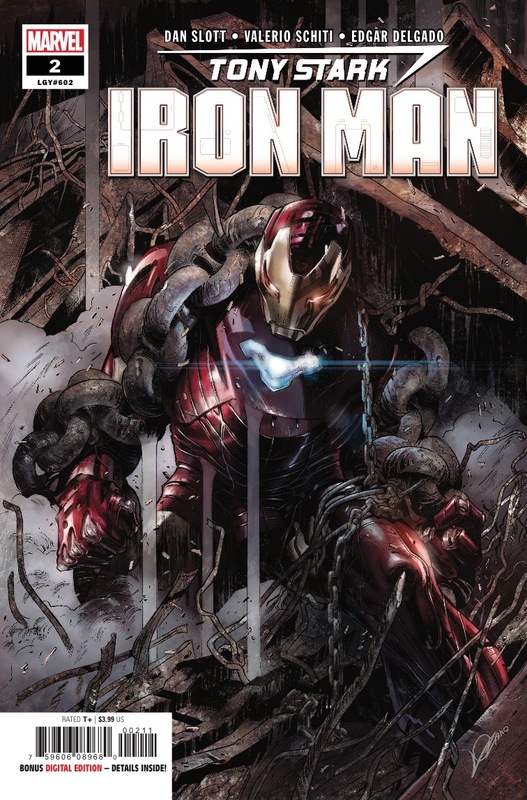 Tony Stark: Iron Man #2 Review – AiPT! James Rhodes, and the supporting cast, come into focus. Writer Dan Slott wowed me with the first issue of the new “fresh start” Iron Man comic. I have high hopes, as it focuses on Tony’s new organization focused on innovation and invention while also keeping A.I. rights in mind. A robot may do our bidding, but is that right? That is explored more in the second issue and it also takes a turn focusing on James Rhodes after being reborn. This is a new direction for Tony Stark as he has a new lease on life after being in a coma for a long time and Slott is building up a new supporting cast for the long haul. That’s exciting because it allows Slott to probe the character in new ways. Dang, he must work out. This is a good issue because it juggles multiple supporting characters at once while progressing the main conflict introduced the last issue ever so slightly. Slott is exploring Jocasta Pym in particular very well (a robot who works for Tony as his chief robotic ethicist) who gains some interesting development in this issue. Her character takes a turn that is surprising, but also adds to the complexity of Tony’s life. We see that first hand when his suit A.I. is discussed and it’s made quite clear using any A.I. in a suit is very immoral. Slott has used Jocasta and the robot ethics angle to create an interesting moral quandary for Iron Man to explore. Subtly though, this issue is about James Rhodes. It opens with him waking from a fever dream after he was murdered. It’s understandable he’d have some emotional trauma from it, but because Tony is so arrogant he doesn’t realize asking him to join him in battle is unfair. His character is taking a new turn too and that’s an additional exciting element of the issue. The art by Valerio Schiti continues to be very clean and pleasing to the eye. The action can be intense the various layout formations keep things interesting. There’s a moment where a character is ashamed that is pulled off nicely too. There’s a digital effect that’s quite cool. This double page layout is quite good. Just one half here. New character Andy Bhang doesn’t get much attention this issue, which is unfortunate since he was introduced and given so much time on the page in the first issue. It’s probably a case of him not getting his turn till issue #3, but it’s worth noting. Tony also seems to be getting very little attention (save for a big twist on the last page). He’s playing the part of arrogant rich dude and there isn’t much more to it. I’m excited to see where the cliffhanger takes us however since it’s the first sign that his character is getting some development, presumably, soon. Another slight gripe I had with this issue is how the main conflict takes a back seat. It’s cleverly tucked in, but the needle isn’t moved much at all. This series continues to be a lot of fun. The action is always present and the supporting cast very interesting. Dare I say the supporting cast is more interesting than the lead character, though? That’s a danger to be sure. The main conflict takes a back seat in this issue too, but it’s all about character in this one so it shouldn’t bother those who enjoy character writing. A solid issue that develops the supporting characters very well.